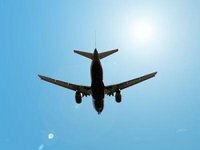 The hijacker of the aircraft on flight from Kharkiv to Istanbul, who demanded to fly to Sochi, was drunk, the plane landed normally, the Security Service of Ukraine reported. "A Ukrainian citizen, born 1969, a passenger of the aircraft on a flight from Kharkiv to Istanbul, was in a state of extreme alcohol intoxication, and tried to enter the cockpit while shouting 'We are flying to Sochi'," Interfax-Ukraine learnt at the press center of the SBU. The passenger was calmed down and searched. He had no weapons or explosives on him. The plane did not change its course and landed in Istanbul as expected, the SBU reported. Upon its arrival in Istanbul, the drunken passenger was detained. The transport prosecutor's office of Ukraine is deciding whether to open criminal proceeding against him. "In any case, this man will be held accountable for his hooligan actions," the SBU said. The security service stressed there was no danger to the aircraft passengers, as the hijacker had no dangerous objects on him.